As mentioned in previous lessons, data analysis resembles using a funel whose job is to select some records and exclude or ignore others. You must present a condition that the funel will follow to allow or disallow some records. A condition is also referred to as a criterion. The plural is criteria. A criterion is formulated using a Boolean operation. Microsoft Access provides many options to specify the conditions. 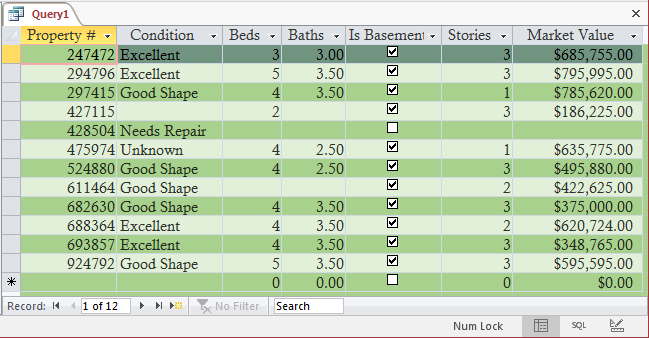 To set the condition by which to isolate records, if a table, a query, or a form is displaying in the Datasheet View, a form in Form View, or a report in Report View or in Layout View, in the Sort & Filter section of the Ribbon (Home tab), click the Advanced button and click Advanced Filter/Sort... A window that resembles the Design View of a query will display. 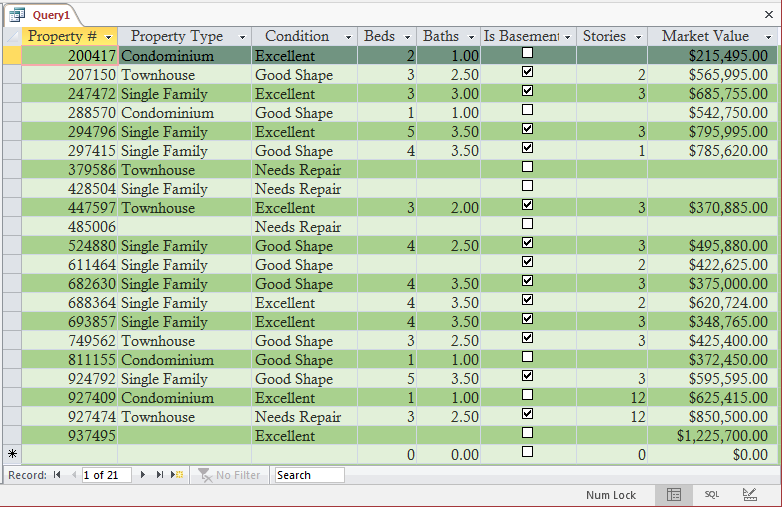 To prepare the condition by which some of the records must display on a table, a form, or a report in Design View, access its Property Sheet. Click Filter and type an appropriate expression. By default, an expression set as the filter will not apply immediately. If you want the condition to apply when the object displays in its regular view, set the Filter On Load property to Yes. Normally, the condition for data anlasysis is set on a data field and that condition applies to the other records. 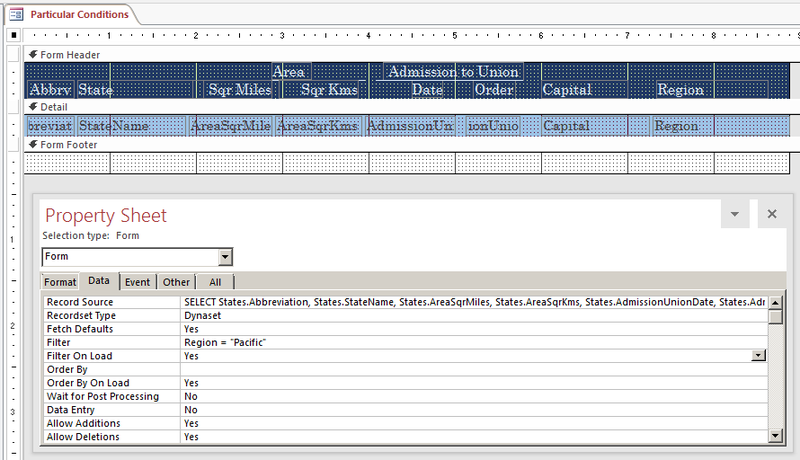 This type of condition is specified in the Design View of a query or a similar window. 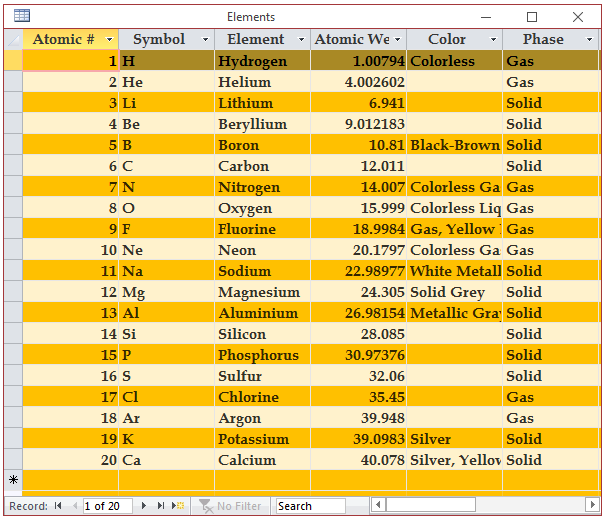 The column-name must be an existing column of a table or query. It is followed by an appropriate operator. The value is the value that will control the condition. 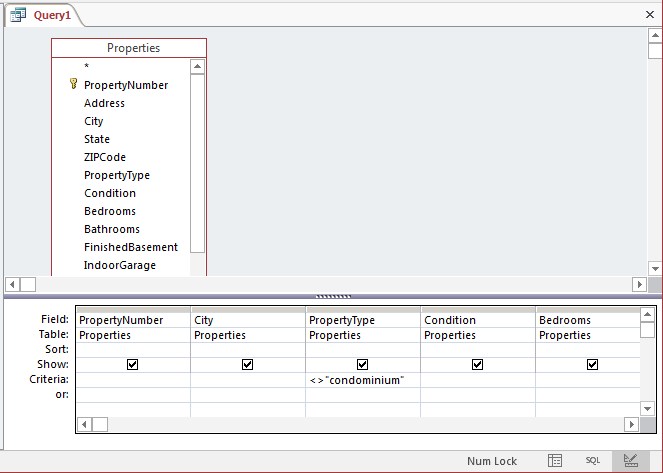 In the bottom side of the window, click the check box below PropertyType and delete "single family"
Sometimes you want the opposite or reverse of an expression. To assist you with this, the SQL provides the NOT operator. There are many ways to use this operator. One way is to precede the operator with the expression. 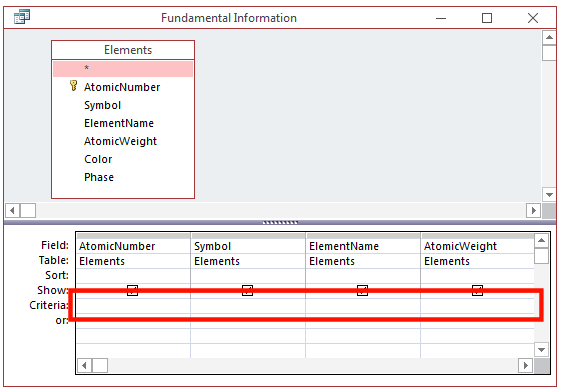 In the bottom side of the window, delete Not "unknown"
If you apply a condition to a SELECT statement, it is obvious that all values of the conditional field would be the same. In some cases, there is no need to show such a field in the result. 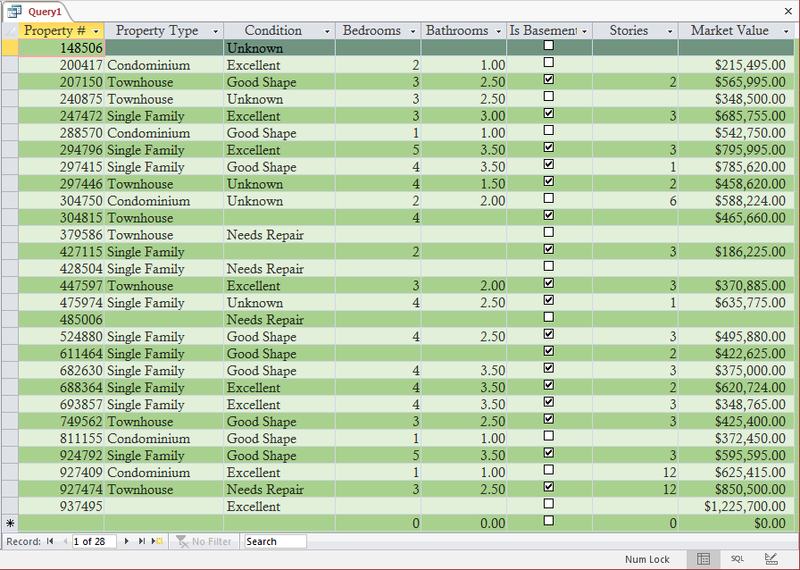 To visually hide a column from a query, in the Criteria pane, set the condition expression in its corresponding Criteria box. Then click the check box of the Show row to remove it. 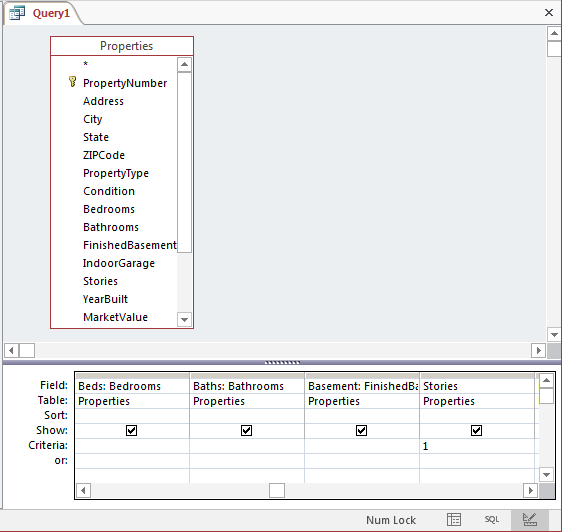 To hide a field in SQL, omit that column in the SELECT statement but involve it in the WHERE condition. A comparison is a Boolean operation that produces a true or a false result, depending on the values on which the comparison is performed. 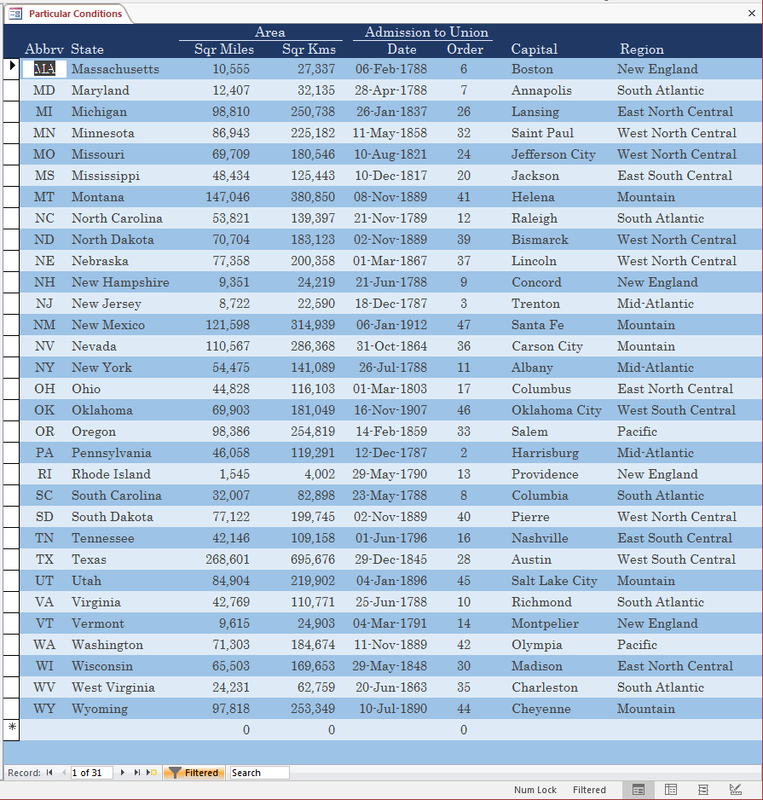 A comparison is performed between two values of the same type; for example, you can compare two numbers, two characters, the names of two cities, the value of one column with a constant, or the values of two columns. The equality operation is used to find out whether two values are the same. If both values are the same, the comparison produces a True result. If they are different, the comparison renders False. As mentioned already, to find the opposite of an equality operation, you can precede its expression with the NOT operator. 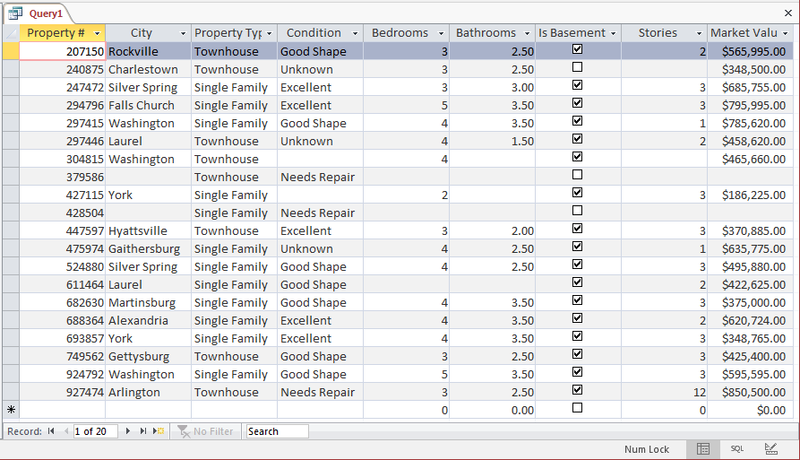 In the Data tab of the Property Sheet, click Filter and type Region = "Pacific"
The Not Equal operator <> is the opposite to the equality operator =. Of course, you can get the result of a Not Equal operation by preceding an equal expression with the NOT operator. If both value1 and value2 are the same, the result is true or positive. If the left operand holds a value lower than the second operand, the result is still true. If the left value is strictly higher than the other Value, the comparison produces a False result. The > operator is the opposite to <=. 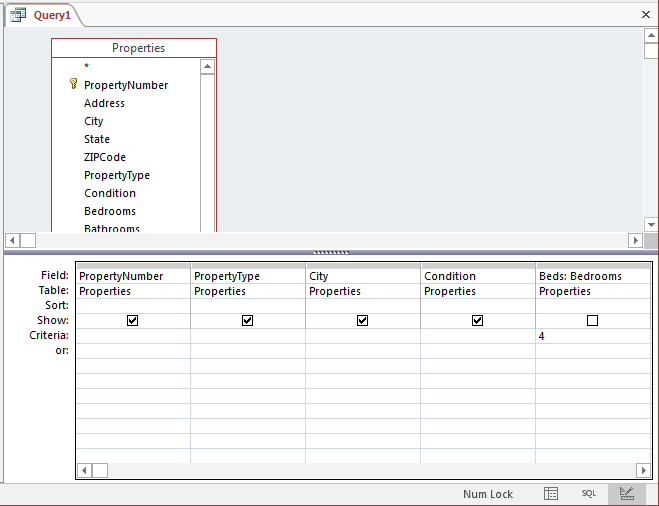 In the Data tab of the Property Sheet, click Filter and type StateName > "Maine"
The >= operator is the opposite to <. 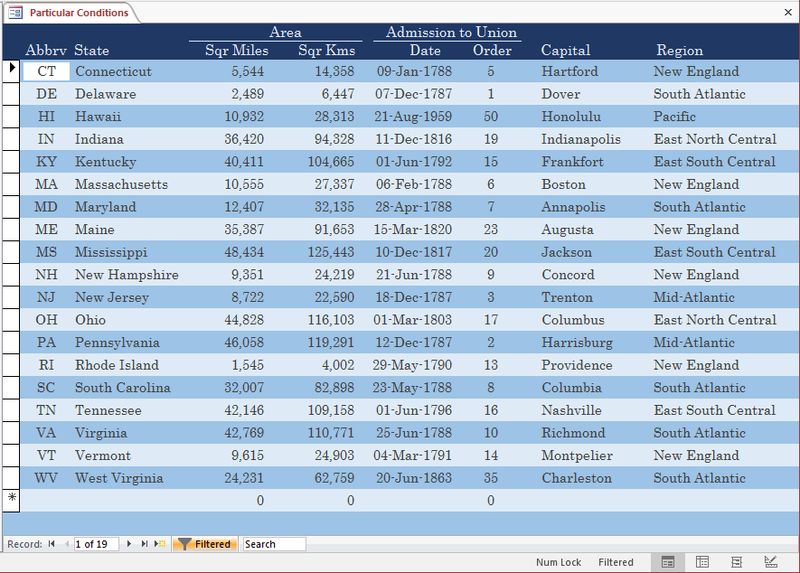 You don't have to sort records when filtering them, but you can. If want to sort the records when designing a query, in the bottom side of the Query window, use the Sort combo box of the desired field.